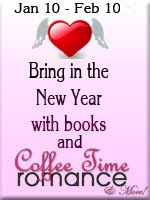 Today marks the starts of the month long even over at Coffee Time Romance & More. There is a mass of authors involved and lots of prizes to be won so do check it out! Enjoy the event and don't forget to visit! As for my day which is the 14th January there will be a competition in which you can win a back copy of one of my ebooks and some of my cards that I make. So keep watching! I'm one of the many, I'm sure, that are in this heart contest with Coffee Time...but I will give a hint...not all the hearts are on the home pages...some are buried very deep on their sites! BUT...the nice thing about this search...is I've gotten to see a lot of very nice blogs and websites and meet a lot of very nice people.